Doors will open at 7pm and activities will run until 11pm. in support of the Dress For Success Toronto charity! 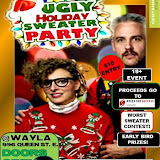 Ugliest sweater contest – Strut your stuff while we vote on the ugliest sweater of all. Door prizes – We’re awarding a $50 bar tab randomly to one of the first few attendees! Silent auctions – Secure some holiday presents and some gifts for yourself! CASH/CHEQUE ONLY. 50/50 draw – You win, the charity wins, we all win. Festive drinks – Spiced eggnog and the candy cane martinis, drink your spirit! Cheesy music – Holiday tracks by Billy Idol, Twisted Sister, Elvis, Adam Sandler and more! Holiday photo booth – Remember the night with a professional photo of you and your friends. Giveaways giveaways giveaways! – Get prizes for just showing up and being awesome! All this and more is in store, we look forward to seeing you on December 5 at Wayla Bar! Please be sure to bring cash as party tickets, the 50/50 draw and thes ilent auction will be cash only. After the event, find your photos in our Picasa web album! *All proceeds generated from this event will be donated to Dress For Success Toronto.